In January of 2012, I decided that I wanted to talk about science fiction and fantasy cover art, particularly the ways women were portrayed. At first, I thought about writing a long blog post, talking about how saturated we were with imagery that emphasized women as sexual objects at the expense of power, agency, realism, and so on. Then I decided there might be a more effective way to encourage discussion. With assistance and surprisingly little eye-rolling or laughter from my wife, I contorted myself into the poses of women on various SF/F covers. 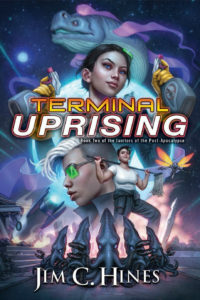 Striking a Pose (Women and Fantasy Covers): The post that started it all. Wait, What Were We Laughing At? The absurdity of the poses vs. the uncomfortable laughter of ingrained homophobia and dudes stepping out of traditionally masculine roles. Cover Art – So Where’s the Problem? Exploring the many different layers to sexist cover art and where it comes from, and providing examples of covers done well. 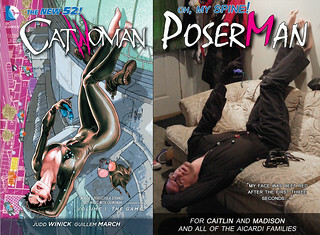 I used Flickr to collect all of my cover poses into a single photo set. As part of the fundraiser, I promised that if we raised at least $15,000, I’d put together a calendar of cover poses. Well, you donated more than that, which led to the 2014 “Year of the Poser” calendar. These calendars were autographed by me and author Patrick Rothfuss, and every dollar made went directly to the Aicardi Syndrome Foundation.